smartphone news and reviews for Windows Mobile Pocket PC, Palm, Microsoft Smartphones and Symbian cell phones. PPT.net has unveiled i-mate's Windows Mobile device Roadmap for 2007. It contains references to the well-known Ultimate, JAQ4, and P30 devices, alongside some lesser-known Odyssey UMTS Windows Mobile 5.0 Pocket PC and X-Series devices - the latter complete with HSDPA and Windows Mobile 6 goodness. In a press event yesterday, Samsung Electronics Germany unveiled, that it plans to release 6 new Windows Mobile 6 smartphones in 2007. Samsung's Manager Norbert Strixner said "the classical German mobile phone market has finally reached a kind of market saturation. However, Samsung sees an increasing demand for smartphones in the prosumer and even consumer segment". According to Strixner, all new Windows Mobile smartphones, which will be available from summer this year, will has Windows Mobile 6 and a improved camera resolution. Currently there are no word if Samsung also plans to release a Windows Mobile 6 upgrade for its newly released SGH-i600. SPB Software House, one of the leaders in the Pocket PC Application world, has just announced that their intentions are to share its products with the Smartphone world. They have not 1 or 2 great products and their presence is missing on the Smartphones. * Spb Insight - a news reading program that gives a rich offline experience along with an easy interface and full RSS/Atom support. * Spb Brain Evolution - one of the most intelligent games for Pocket PC and Smartphones! If you or your friends have a Windows Mobile for Smartphone device and want to participate in future beta programs or be notified of our new Smartphone products, just leave your email at the top of this page. You will have a chance to be the first to test the brand new Spb software. Users that provide us with the most valuable feedback will get free copies of the products they test. So if you are interested to become a smartphone application beta tester you can sign up here. 3jam Reply-All Text Messaging is just released application for Windows Mobile Smartphone platform which lets you easily reply to multiple people at once. 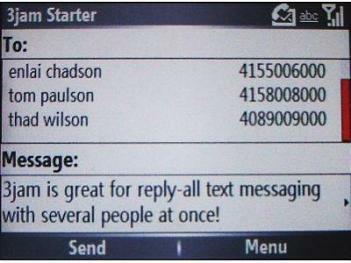 3jam Reply-All Text Messaging is available for free download at Smartphone Freeware site. Toshiba G500 was recently announced by Toshiba Windows Mobile based slider Smartphone, which is quite similiar to O2 XDA Stealth. And here comes maybe the first review of Toshiba G500 published worldwide. This Windows Mobile based slider smartphone marks Toshiba's comeback into the Windows Mobile market and it sure is a successful comeback as the first of the two new models the company will launch in 2007 (while the second is the Pocket PC Portege G900) is a neat piece of hardware that features great specs all stuffed into a relatively tiny shell. Here are its main specs: 2 Megapixel main camera and VGA front camera for video calls, Bluetooth and Wi-Fi, biometric fingerprint recognition sensor that also serves as a directional pad with selection function as well and, most of all, UMTS and category 6 HSDPA (that theoretically can reach a maximum download speed of 3,6 Mbps) connectivity and a dual processor architecture are but a few features that put the Toshiba Portege G500 at the top line of the present offer of Windows Mobile-based smartphone. The whole review is made by folks at pocketpcitalia.com and you can read it here in italian or translated in english. Here we offer you a list of top 5 Smartphone freeware applications ordered by number of downloads made from Smartphone Freeware site. We are hoping this list will help you stay in touch with the latest trends around smartphone programs. Very nice and smooth looking Clown Fish iphone like today screen theme for your Windows Mobile powered Smartphone. Best working with Windows Mobile 2005. There are two version of it in the zip file - one for Facade and one "Standard" version which uses only standard or free plugins. The first official Weather Watcher Mobile Smartphone release.Weather Watcher is your personal Windows mobile weather station. Automatically retrieve the current conditions, hourly forecast, daily forecast, detailed forecast, severe weather alerts (US only) for over 77,000 cities world-wide. Mobile GMaps is a FREE application that displays Google Maps, Yahoo! Maps, Windows Live Local, MSN Virtual Earth and Ask.com Maps and satellite imagery on Smartphones, Java J2ME-enabled mobile phones, PDAs and other devices. The application works quite well with these maps providers and the best thing about it that it is in your Pocket everywhere you are. gCalc v1.0 is a calculator application, a simple one, but is good for one-hand use. And, it works great on a Windows Mobile Smartphones! For latest Free Smartphone software you can subscribe to our RSS Feed . One of the latest Smartphones included in Vodafone's portfolio is Vodafone v1210. I have previously talked you about it's launch in this article - Vodafone about to lauch the 1210 smartphone aka Vodafone VDA IV and now it is time to review it. For years Vodafone users have been able to purchase i-mate branded Windows Mobile devices from Vodafone stores and it is only now that a Vodafone-branded Windows Mobile device arrives here. This honour goes to the Vodafone 1210, a budget Windows Mobile Smartphone designed and manufactured by ASUS. Security concious organisations such as government offices, intelligence agencies or even private companies will like the idea of a fully functional Windows Mobile device, able to synchronise to their Microsoft Exchange servers, but without the camera. That's right, at last a business mobile phone without a built-in camera. The Vodafone 1210 is a small candy bar style mobile phone, running Microsoft Windows Mobile 5.0 for Smartphone. There is no word from Vodafone if an update to the recently announced Windows Mobile 6.0 for Smartphone will be available. Read the whole review made by folks at geekzone.co.nz here. Our friends from CoolSmartPhone.com has just got their hands on a photo that can confirm that the HTC Vox will join the Orange Army of great handsets as Orange SPV E650. This innovative new phone comes with a standard numeric keypad coupled with an auto-sliding QWERTY keyboard underneath. It's expected to run Windows Mobile 6.0 Standard (Smartphone) and have a 2 megapixel camera with quad band, Bluetooth and Wi-Fi connectivity plus MicroSD memory card slot. Top Downloaded Free Windows Mobile Smartphone software Last Week Here we offer you a list of top 5 Smartphone freeware applications ordered by number of downloads made from Smartphone Freeware site. We are hoping this list will help you stay in touch with the latest trends around smartphone programs. TxtMan is a threaded SMS program for Windows Mobile 5.0. It sends and receives text messages (SMS) and displays the messages as a conversation, like an instant messenger client. After the release of free vertical internet search application for Palm OS Boopsie, now we have a Boopsie for Windows Mobile Smartphones. Boopsie is a mobile search provider. The Boopsie client is a thin, yet powerful, layer between you and what you are trying to find. Boopsie does not contain the data; it creates and uses special indexes to find the data on other content providers sites. In short - you can type less using Boopsie. Boopsie uses a multi-term prefix incremental search. As you type letters, Boopsie is dynamically searching to find what you are typing - and showing your results in real-time. So, you get immediate feedback and minimize spelling errors. Once you see what you are looking for, you click on it and Boopsie links you to the appropriate web page. Google, Yahoo and others use a traditional form based search. You have to type the whole set of words you are looking for and then hit a Go or Submit button. Then, you have to look thru a bunch of results to find what you're after. Boopsie currently supports current channels: Amazon Books, Amazon Grocery, Caltrain Schedule, Celebrity Photos/Search, CitySearch SiliconValley, Date and Time, Dictionary, Encyclopedia, Epicurious, Fandango, IMDB, Sports Scores, Surf/Ski reports, Stock quotes, Thesaurus, Wikipedia, etc. Boopsie for Windows Mobile smartphone is available for free download at Smartphone Freeware site.